Click here to view and download infographic. Top U.S. heart centers implement a collaborative, multidisciplinary alliance to improve the treatment of patients with a type of irregular heartbeat called atrial fibrillation (Afib). Leading Afib patient advocacy group, StopAfib.org, is partnering with NAIAC to provide the patient perspective and ultimately shape how care will be improved through the alliance. NORFOLK, VA – Five of the nation’s top heart treatment centers and a leading patient advocacy organization today announced the formation of the National Alliance of Integrated AFib Centers (NAIAC). These organizations will join forces to combat a growing and life threatening condition called atrial fibrillation. 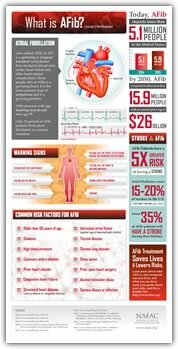 Also known as Afib or arrhythmia, this cardiac condition affects nearly 5.1 million people in the U.S., a number that could rise to 15.9 million by 2050. By working together, NAIAC members will improve the care delivered and enhance the quality of life for Afib patients. Click here to view and embed video. NAIAC will connect Afib patients with the closest center of excellence for treatment to ensure the highest standard of care, and will provide additional educational support about their many options. The highest standard of care means that an individual is treated by a cardiothoracic surgeon who works closely with an electrophysiologist, a cardiologist who specializes in heart rhythm disorders, as well as a patient care coordinator. The health care team, along with the involvement of the patient, will design the best treatment care plan tailored to the patient’s individual needs. NAIAC centers have an unparalleled degree of experience in the management of Afib and will collaborate to provide patients with the full array of treatment options available to inform their decisions, from management with medication to minimally invasive or open chest surgical procedures, depending on patients' needs. Afib may feel like a fluttering or rapid heartbeat. Sometimes, it can feel like chest and throat pressure resembling a heart attack. Patients may dismiss the symptoms as insignificant. However, left untreated, Afib can lead to a multitude of heart problems, including heart and valve diseases, sleep apnea and chronic fatigue. It can also lead to congestive heart failure and stroke. In fact, Afib increases the risk of stroke five-fold. The National Alliance of Integrated AFib Centers (NAIAC) is a coalition of hospitals, physicians and treatment centers that use an integrated approach to treat cardiac arrhythmia. Its goal is to foster synergy between cardiac specialties to provide a comprehensive and personalized approach to treating Afib, atypical in most settings. NAIAC cardiothoracic surgeons work hand-in-hand with electrophysiologists, cardiologists and other providers to determine and deliver the best treatment based on each patient’s individual needs. Alliance members also partner together, across facility and practice boundaries, to share data, research and resources, all in an effort to improve education and to advance the treatment of Afib. The long-term vision for NAIAC’s evolution is to eventually grow to other leading heart centers across the country to improve care for more Afib patients.